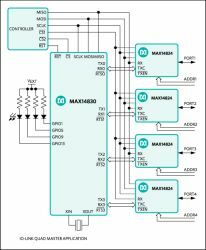 Create a design and simulate using EE-Sim® tools: The MAX14830 is an advanced quad universal asynchronous receiver-transmitter (UART), each UART having 128 words of receive and transmit first-in/first-out (FIFO) and a high-speed serial peripheral interface (SPI) or I2C controller interface. A PLL and fractional baud-rate generators allow a high degree of flexibility in baud-rate programming and reference clock selection. Each of the four UARTs is selected by in-band SPI/I2C addressing. Logic-level translation on the transceiver and controller interfaces allows ease of interfacing to microcontrollers, FPGAs, and transceivers that are powered by differing supply voltages. Extensive features simplify transceiver control in half-duplex communication applications. 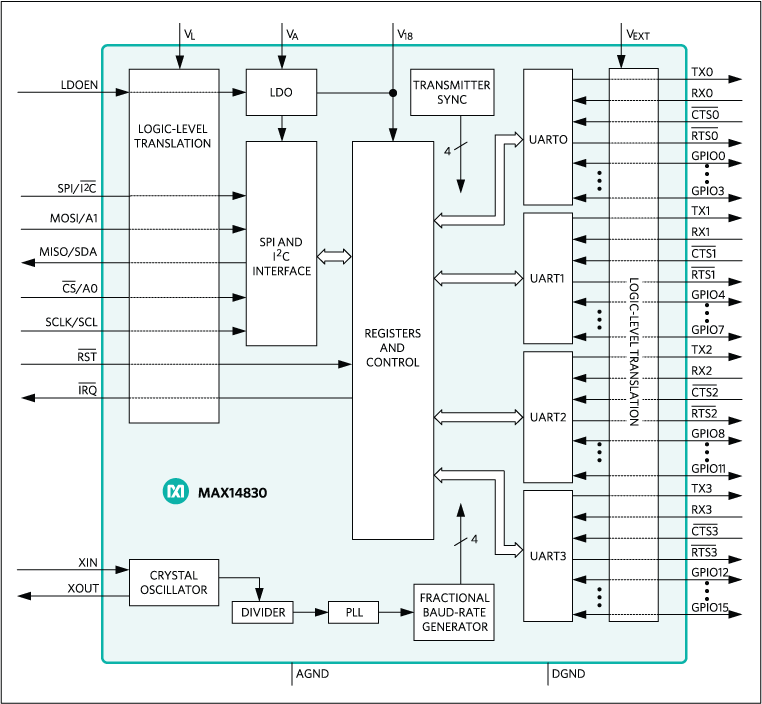 The MAX14830 features the ability to synchronize the start of individual UART's transmission by SPI-based triggering. On-board timers allow programming of delays between transmitters as well as clock generation on GPIOs. The 128-word FIFOs have advanced FIFO control reducing host processor data flow management. The MAX14830 is available in a 48-pin TQFN (7mm × 7mm) package and is specified to operate over the extended -40°C to +85°C temperature range.